This photograph was taken on April 7, 2009 at the DoD Retirement & Awards Luncheon. At that time, luncheons were held ash the Hale Koa Hotel. 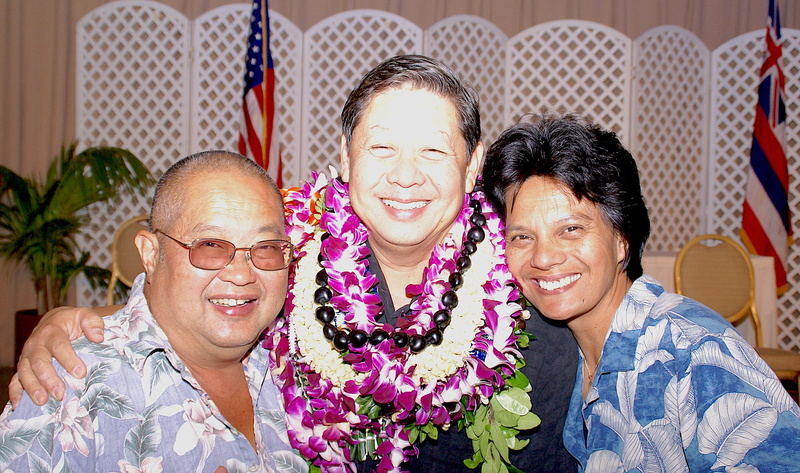 in the photograph are Neal Nakayama, Lester Ho, one of the retirees honored that day, and Annette Gagarin. Neal was a Traditional Guardmember who served in the maintenance complex, who retired after many years of service. In civilian life, Neal worked for the United States Postal Service. Lester enlisted in the Hawaii Air National Guard in 1977. He served initially in the then-Consolidated Base Personnel Office (CBPO) and became full-time as an AGR. He later transferred to the 154th Maintenance Group and finally transferred to the then-154th Mission Support Flight. Annette has served as a AGR for many years in the Hawaii Air National Guard. She worked in a number of units in the Admin/Personnel area and currently in the front office of the 154th Maintenance Group.